Iodine Fuming is one of the traditional development methods which is generally used on porous materials such as paper and cardboard and is generally applied before Ninhydrin or Silver Nitrate processing. 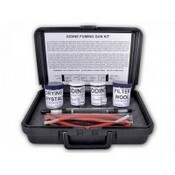 The CHE3406 Iodine Fuming Kit contains a .75" diameter glass tube iodine fuming apparatus, drying crystals, filter wool, Iodine crystals, and instructions in a sturdy plastic carrying case. To use the fuming gun, iodine crystals, filtering wool, and drying granules are inserted into the glass tube. Gently blowing into the gun warms the crystals, allowing them to release a vapor which is directed onto the area to be fumed via included tubing. When fuming is completed, the gun may be kept assembled until the crystals have been exhausted.